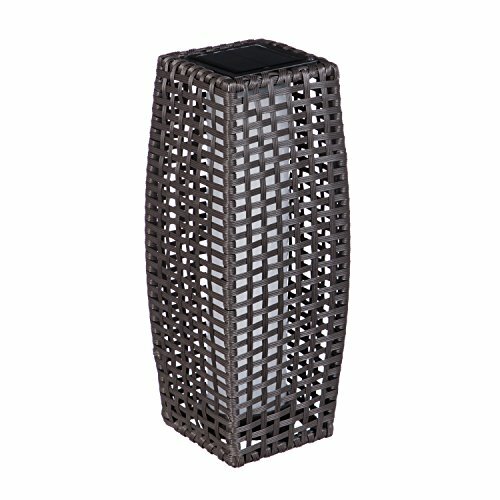 Light the night with this rattan outdoor solar floor lamp. The charming design will delight during the day and add an enchanting ambient glow to your yard throughout the night. Its embedded solar panel collects sunlight to power the piece once darkness falls.For best results, allow the product to be directly in the sun for at least 8 hours to charge. When fully powered, the lamp glows for 6 to 8 hours. Includes 1 AA NI-MH 300mAh rechargeable battery. Crafted from durable, outdoor-safe plastic. Crafted from durable, outdoor-safe plastic.